Are so durable that the vast majority of them installed over the past 25 years are still in use. And, at the end of their useful life – like all vinyl – they can be recycled. Reduce electricity usage! A study conducted by Franklin Associates found that using vinyl over alternative framing options saves the U.S. nearly 2 trillion BTUs of energy per year – enough to meet the yearly electrical needs of 20,000 single-family homes. Vinyl can be reprocessed and recycled repeatedly. Scrap is routinely recycled into other vinyl products. In fact, 99% of the vinyl used by processors goes into a finished product. More than 8 million pounds of window profile waste is diverted from landfills annually thanks to successful buy-back programs initiated by window manufacturers like Alside. 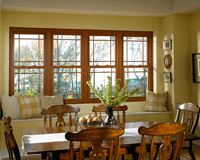 So, when you are ready to replace your windows make an eco-friendly choice with Alside windows, installed by Gravina’s!